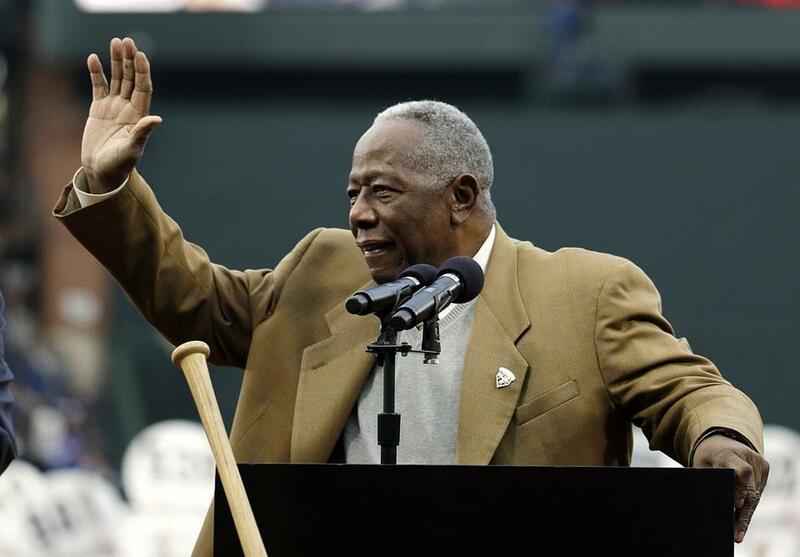 Hank Aaron was honored in Atlanta on the 40th anniversary of his 715th home run. Henry Aaron, 80 and gray, isn’t through talking. That’s good. I hope he keeps talking. What he has to say is important, vital to the discussion of race in our country, and it’s obvious that he doesn’t think he said enough in the 1950s, ’60s, and ’70s when he commanded center stage in the sports world. His message, which came through loud and clear a couple of weeks ago in an interview with USA Today, is that racism still exists in America, despite the strides we have made as a nation, a people. None of that, of course, is the slightest revelation. We all know that, or should be truthful enough to admit it. For those of us who don’t, or those of us who pretend otherwise, then nothing Aaron ever will say on the subject is likely to resonate. A mountain of common sense can do little when up against rock-stupid. In the days leading to the 40th anniversary of his 715th home run, the one that slipped him ahead of the legendary Babe Ruth in the record books in April 1974, Aaron noted to USA Today’s Bob Nightengale that he has kept much of the hate mail, some of it including death threats, that he received in the days prior to breaking Ruth’s record. I hope you read that twice, if not more, as I did, and pondered the profound ignorance and hate it took for someone first to write that, then to go to the bother and effort to make sure it reached Aaron. America was a different place then, right? As it turns out, yes and no. We can only hope that there aren’t as many of those kinds of people in America anymore, but that may be false hope, as Aaron quickly learned in the wake of his remarks. Had Aaron limited his comments to those rather vague yet poignant remarks, it likely would have been enough to stir up a fair bit of bile from the sick, silty river bed of hate in this country. But, thankfully, he went a few steps further, as if firing back some of the brushback pitches that were tucked under his chin over the course of 23 years and 13,941 plate appearances. And it touched off a firestorm. “Sure, this country has a black president,’’ Aaron noted to Nightengale, “but when you look at a black president, President Obama is left with his foot stuck in the mud from all the Republicans with the way he’s treated. What a delightful cocktail of wisdom, impatience, and anger. Career home run No. 756 for Hammerin’ Hank, a sheer delight to hear someone rip into the truth as if wheeling the wood into a 3-and-0 fastball. I’d like to think Obama couldn’t have said it better himself, but Obama has had five-plus years in the Oval Office to be that bold, only to time and again keep to his message, opt for polite politics instead of identifying obstructionists, naming names, pushing back, exposing self-interested frauds. Maybe that will be the 80-year-old Obama. If so, what a shame that he didn’t say it while he commanded center stage. Aaron now feels he was mistaken years ago to remain quiet, to keep sucking it up, to suffer in silence. Why would he have kept those letters? Why would anyone preserve such filth? For more than 40 years, Aaron stored them away, the fetid prose lingering in his mind and psyche. A man doesn’t keep that kind of trash in hand without knowing that one day, when the time is right, he’ll find the right way to dispose of it. He found it. Predictably, in doing so, he provoked even more hate, delivered in a deluge of e-mails to the Braves’ front office. The responses only proved his point. There is an aura about Aaron, far beyond the numbers on his career record sheet. I interviewed him briefly near the end of his playing career, and he exuded a rich, deep sense of dignity and grace. Again, he was polite, gracious, engaging. The more I said I wouldn’t keep him on the phone, the more he kept talking. The story line was thin, but his words filled it out, gave it weight, made it a worthwhile write. Aaron, tolerant too long, is talking now to make up for lost opportunity. That is not rare for someone his age. He is in his late innings. All those years gone by, all that hate heaped his way, still today, and he finally wants us to know what he knows. We should listen, especially so if the haters call him names and tell us not to waste our time.